Meteorites have been colliding into Earth for billions of years. They have played a part in shaping the geological structure of our planet as we know it today. The study of meteorites can give a view into the make up of the universe. However, many of the meteorites recovered today have been “terra formed” by our planet. After hundreds of thousands of years being exposed to oxidation and geologic erosion, little of the original material remains to study. What is left behind is usually rust, such as limonite, goethite or maghemite. Sometimes the solid iron core of the meteorite is able to last and some meteorites, such as the Sikhote-Alin, which crashed in the Russian mountains of eastern Siberia in 1947, still retain their black fusion crust, but even these meteorites are starting to show signs of rust. Chloride ions create the electrochemical environment for corrosion to take place in iron meteorites, and the source of these chloride ions is ground water. 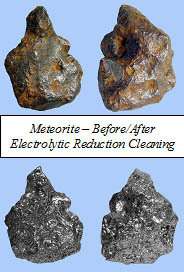 A technique called electrolysis works to remove these chloride ions from the iron meteorite and in the process removes the outer layers of corrosion and so restores the meteorite to its original “extra-terrestrial” state. Electrolysis or electrolytic reduction cleaning is a process that eliminates chloride ions in iron specimens, stabilizing the iron, and preserving the specimen. The idea is if a meteorite is exposed to warming and an increase in humidity, then the hydroxide ions can exchange with chloride ions, separating them from the meteorite and be flushed back into the solution. The technique was first used in the field of marine archeology as a way of restoring iron artifacts from ancient shipwrecks. The success of the process has allowed meteorite researchers to apply it to their work.